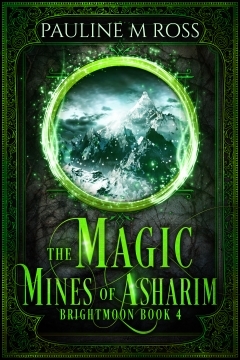 The Magic Mines of Asharim is the fourth book set in the Brightmoon world. It’s a stand-alone book, with a completely different location and a new set of characters; you don’t need to have read any other Brightmoon books to enjoy it (although for those who’ve read The Plains of Kallanash, you will learn a little bit more about some mysterious creatures from that book!). The Magic Mines of Asharim is written by Pauline M Ross, with cover design by Deranged Doctor Designs and proofreading by Coinlea Services.